Students who transfer to St. John’s benefit from our focus on academic excellence, elite internship opportunities, and generous transfer scholarships. The quality of a St. John’s education reflects our 148-year-old mission as a Catholic, Vincentian, metropolitan, and global university. *The data here is representative of the three graduating classes (September 2016, January 2017, and May 2017) from the three main campuses (Queens, Staten Island, and Manhattan). The data provided here pertains only to those 73% of undergraduates who responded to the survey. It is often the case that a student enters college unsure of what program he or she wants to pursue. We support this journey by offering more than 100 programs of study built on an “options-oriented” core curriculum that prepares students for success in a challenging academic environment. Exclusive majors such as Actuarial Science, Biomedical Sciences, six-year Doctor of Pharmacy, and Mathematical Physics are offered in addition to larger programs such as English, Biology, Homeland Security, Adolescent Education, and so much more. St. John’s University provides students with a global education, both inside and outside the classroom. Nearly 40% of St. John’s students study abroad at some point during their undergraduate career, and countless others see the world through SJU-sponsored service plunges. In addition to three New York City campuses—Queens, Staten Island, and Manhattan—St. John’s has a campus in Rome, Italy, as well as study locations in Paris, France, and Limerick, Ireland. Students have the opportunity to spend a semester in Rome or Paris, or they can opt for the Discover the World program, which allows them to spend five weeks each in Rome, Paris, and Limerick over the course of one semester. The mission of St. John’s is that of service, following the lead of St. Vincent de Paul’s teachings that we are collectively responsible for caring for those around us who are in need of assistance. This philosophy is engrained into every aspect of the St. John’s experience—from the classroom to the arena and beyond. The student-run organic garden on the Queens campus helps provide food for those in need through the St. John’s Bread and Life program. Students also participate in Midnight Runs to Manhattan, providing food and clothing to the homeless population of New York City. It’s also not uncommon to find that many students will spend their spring breaks building houses for Habitat for Humanity or hopping a flight to Panama to help build a school. Leaders are not born—leaders are developed. And true leadership is not just about a grade point average or a Big East championship. A St. John’s educated leader finds true career inspiration from wanting to make the world a better place for everyone. This is proven over and over again by the 183,000 alumni who help create a network of opportunity that has helped current students land internships in places like the White House, Major League Baseball, Merrill Lynch, Goldman Sachs, the New York Yankees, and so many others. 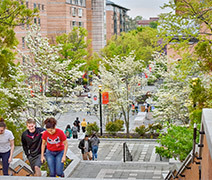 The opportunities that exist in New York City are countless—and they allow St. John’s to offer more than 100 undergraduate programs of study that are taught by leaders in their fields who dedicate themselves to sharing their unique experiences with all students. As a matter of fact, personal attention is so important to St. John’s that the student-faculty ratio is an impressive 17:1. Experiences outside the classroom are also essential to overall development—and what better place to be for those experiences than New York City! Students cheer on the men’s basketball team from Madison Square Garden, and the Campus Concierge provides students with discounted tickets to professional sporting events, Broadway shows, and countless other cultural events. 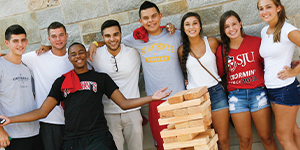 Learn more about how the St. John’s experience will propel you forward at stjohns.edu. 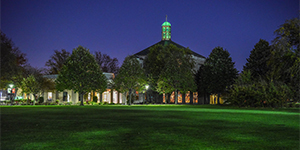 The Queens and Staten Island campuses offer daily information sessions and tours. Learn more at stjohns.edu/visit.